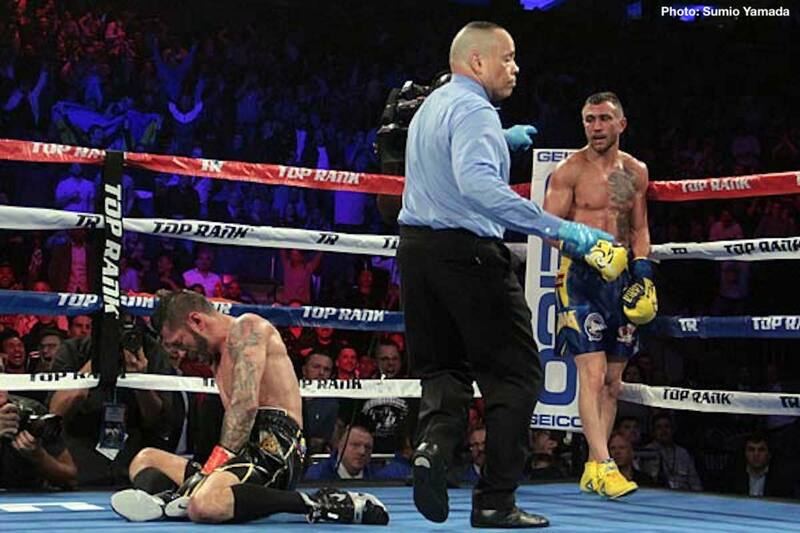 What next for the brilliant Vasyl Lomachenko? After he has had himself the decent rest that is needed after his at times tough and testing battle with Jorge Linares (it was revealed at yesterday’s post-fight press conference how Lomachenko had a problem with his shoulder in the early going of the fight), the newly crowned lightweight king will likely look for another big fight at 135. And going by what “Hi-Tech” had to say after last night’s FOTY candidate of a win, a big lightweight unification fight is his bout of choice. As quoted by RingTV.com, the 11-1(9) “Loma” said he will be “looking for” a unification fight next. “That is why I came to this weight class and that’s what we’ll be looking for,” he said. The obvious big fight that would fit the bill is Lomachenko against Mikey Garcia, the reigning WBC champ at 135. Providing he gets past Robert Easter, who he is set to meet in a WBC/IBF unification clash in July (a Garcia win being no sure thing) Garcia against the brand-new WBA/Ring lightweight king seems a great and obvious fight to make. However, as Bob Arum explained to RingTV.com, there is more to making this fight than many fans would perhaps think. So there! Garcia (again, if he beats Easter) may look towards a four-belt unification with Lomachenko or he may not, but Arum has made it clear he will stand for no hard-ball negotiating, or any negotiating at all. But if it’s not Garcia next, then who else could Lomachenko fight? A return with Linares is at least a vague possibility seeing how special last night’s fight was. There is also WBO 135 pound champ Raymundo Beltran – a warrior who has proven he will fight anyone, anywhere. There is also current IBF boss Easter, should he get past Garcia in July, and maybe one or two other guys; while Arum also briefly mentioned a Lomachenko-Manny Pacquiao fight, for later this year. Whether or not Lomachenko feels any heat from that particular fight is open to debate, though. In terms of his legacy – the most important thing to Lomachenko – unifying the lightweight titles seems to be the main objective. But will the other 135 pound champs be realistic enough to be able to play their part in getting these fights made? Previous boxing news: Vasyl Lomachenko and Jorge Linares give us something special!